Posted by Arun Rajagopal in Advertising, Conversations, Digital, Movies, Social Media, Travel. 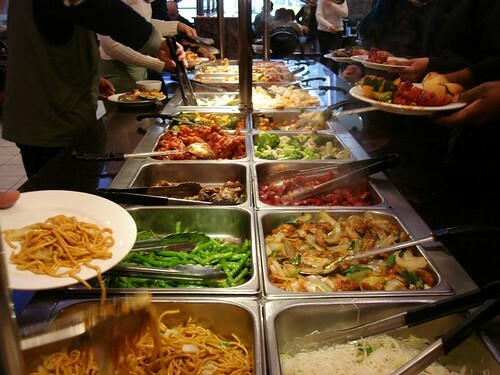 Chinese “Mid Town Buffet”, NYC, originally uploaded by MidtownLunch. Blogger buddy Ryan Barrett tagged me in this interesting meme called: What’s your media diet? Her interesting post made me think deeper about my own media consumption and how I want to improve my media diet. After all the kind of media you consume, defines what kind of person you are, right? Print: I’m fond of two dailies – Times of Oman & Times of India, though I’m not a regular reader. Reading Times of Oman is something that I want to do first thing when I get to work. I especially dig catching copy mistakes in TOI. Magazines: I’m a voracious reader of magazines. I especially dig Time, Ahlan Masala, Esquire and National Geographic. I last read British Airways’ in-flight magazine “High Life“. I’m very fond of in-flight magazines and used to collect them as a kid. Next on my reading list comes “Forbes 2008 Guide to the Biggest Companies in the World” & “America’s Largest Corporations Fortune 500”. Books: I used to be a compulsive bookworm when I was a kid, but I’ve been reading less lately. It’s an appalling habit I’m working on and the first step towards that is building a mini-library at home. I last read Deepak Chopra’s Buddha and John Grisham’s The Summons. I’m currently reading Rohit Bhargava’s Personality Not Included and John Grisham’s The King of Torts. Online: I read the following news portals on a daily basis: Indiatimes.com & Rediff.com. Both websites keep me connected to current affairs in India. Cricinfo.com feeds me fodder on cricket. Wikipedia.org gives me much needed dope on topics I pluck out from thin air. I browse daily through Arabianbusiness.com with a particular focus on the aviation & travel industry. If you didn’t know, I’m a total transportation buff with interests in trains, planes and buses. I’m also a regular visitor to the picture galleries of IRFCA.org (slakes my passion for Indian Railways). Blogging: My personal blog www.arunrajagopal.com is where I talk about my travels, rail-fanning adventures, my 2-cents on advertising and social media and the many things I find interesting in life. I don’t consider my blog as an expert authority on marketing. The most important purpose of my blog is to help me stay connected to some of my very dear friends who are leading marketing bloggers around the world. Through my blog, I reach out to them and become a part of their lives. My blogging frequency is usually 4-5 blog posts per month. A few weeks ago, I started another blog on Tumblr that serves as my bookmarking diary. I usually read blogs related to advertising, digital and social media such as Adgoodness, Adsoftheworld, Adblogarabia, Adverblog, and the ones on my blogroll. I check out all my incoming links via my Technorati page and WordPress dashboard. Some blogs & websites I want to spend more time on are Micro Persuasion, The Buzz Bin, The 360 Digital Influence Blog, Logic+Emotion, Copyblogger, Marketing Profs Daily Fix, Bannerblog, Digital Media Wire & MediaPost Publications. Email: Email is probably the important part of my media mix. I love to check my email every 5 minutes (ideally) when I’m in front of a comp. If I’m on the go, I check my mail on my Nokia N73 music edition using my Oman Mobile Hayyak prepaid connection. My email is my lifeline! I’m a compulsive yahooligan and somehow don’t feel so attached to Gmail or Hotmail. Television: I’m not too fond of TV and prefer spending as much time away from the box as possible. I dig MTV, Channel V, VH-1, cricket channels, popular channels in Tamil & Malayalam. 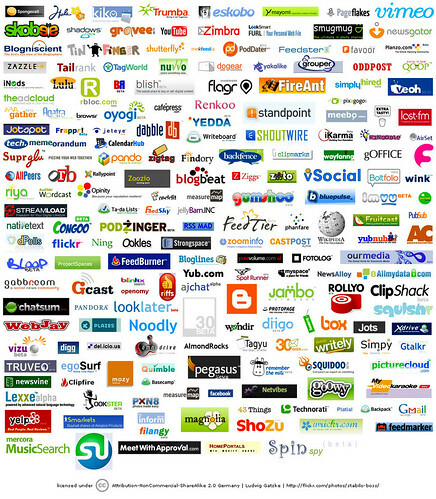 Web 2.0 Logos, originally uploaded by wp4lib. Social Media Tools: I’m active on Facebook and LinkedIn. I don’t believe in needlessly adding people to hike up numbers, and I ensure that I only have people in there who I need to be in touch with. I dig most of the Facebook applications such as the quizzes (I try most of them and then weed them out occasionally) and feel that the new Chat feature offers an exciting way to connect with people. My Facebook account is a more personal window for me to reach out to my friends; while my blog is the world’s informal window to my life. I’ve given up on Orkut, even though I have quite a bit of friends there who are not on Facebook. I haven’t yet started podcasting. I do vlogging, especially of my travels. I’m very active on Flickr with a large collection of travel photos, trains and destinations. Nope, I don’t do Second Life or Skype (it’s blocked in Oman). I’m on YouTube, Daily Motion, Vodpod and Vimeo, and I‘m just setting up my second del.icio.us account. Chat: MSN Chat is an inseparable part of my life, especially with its online text messaging tool. I used to be a total Yahoo Messenger junkie back in the days. Twitter: Twitter is the latest addition / addiction in my media mix. Not only does it serve as a link feed for interesting blog posts and news resources posted by people with like-minded interests, it also helps me keep track of what my friends across the globe are up to. My mission is to maintain building my Twitter list as an authority base of thought leaders passionate about advertising, social media and global perspectives; and to continue updating my KQ. Music: A very important part of my existence. I’m usually listening to music while I’m at work, at home or on the commute. I need music to play in the background for me to get going. At work, I plug into my headphones hooked up to my PC, while at home I choose to go with the home theatre system, laptop or the box speakers plugged into the iPod. I have an iPod Touch, an iPod Shuffle & a Nokia N73 music edition loaded with my fav tunes. I listen to English, Hindi, Malayalam, Tamil and Telugu music. For some reason, I love songs more than the artists. I have never used iTunes store till date, and visit a lot of blogs and music streaming websites to get my music. Miscellaneous media consumption: I don’t use a feed reader. I subscribe to blogs such as The Viral Garden, ChrisG.com through email. I get updates on Jakob Nielsen’s Alertbox, Bowen Craggs Web Tips and a Google Alert on “Arun Rajagopal” in my email. I subscribe via mail to Ad Age Daily, Ad Age Digital, Creativity Online, BestAdsOnTV and MarketingProfs Today. I do not keep a diary, though I rely heavily on handwritten lists to get through my daily grind. I particularly keep an eye out for outdoor media, POS, in store experiences and billboards. I love Times Square for the same reason & I totally adore the M&Ms (click on link to watch video) board out there. I like the HSBC perspective posters they have in the air-bridges at London Heathrow. I love interesting messages that are placed in the most obvious places. What’s your media diet? I’d love to hear from Tim Brunelle, Linda Sherman, Cam Beck & Ryan Karpeles. Do spread the meme far & wide. Quibblo Personality Quiz – What is your media consumption level? Loved reading your media list, Arun. When people are not convinced of the value of Twitter, I tell them about the wonderful people I’ve connected with there and the happy coincidence of being able to meet in person someone who lives on the other side of the world from you. It was so great seeing you in New York and then San Antonio! Wow! Great list. Thank you for sharing, my friend. Great post. Funny, I never really thought about in-flight magazines as a piece of my media diet… but I suppose I do read them every time I fly. Arun, I love how you put so much effort and detail into your posts. It’s so rich – I get the feeling I’d love your country’s desserts and food (Crazy thought I know). Interesting… another person out there is thinking about how he consumes media. I’m trying an experiment for the month of June 2008. I’m going to cut my ties with popular media for a month and see how it affects my life. I’m definitely going to link to your blog. very interesting blog arun i read ur blog first time & its gud!